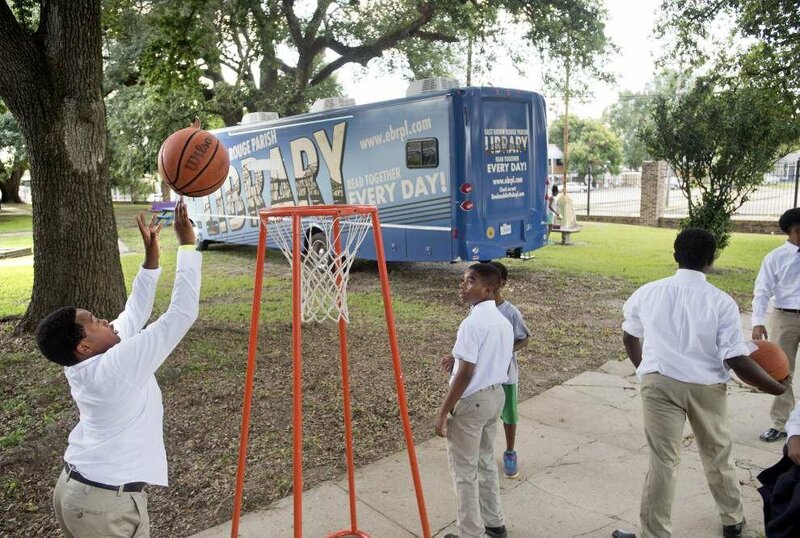 Advocate staff photo by TRAVIS SPRADLING -- Young Leaders Academy member Xavier Glover, 11, left, shoots a basket near the nearby East Baton Rouge Parish Library traveling library , after a Friday press conference to launch Baton Rouges 'My Brothers Keeper Local Action Plan,' at the Family Youth and Service Center. The hoops were one of the activities of the related EduFest educational festival that will help youth with life skills. 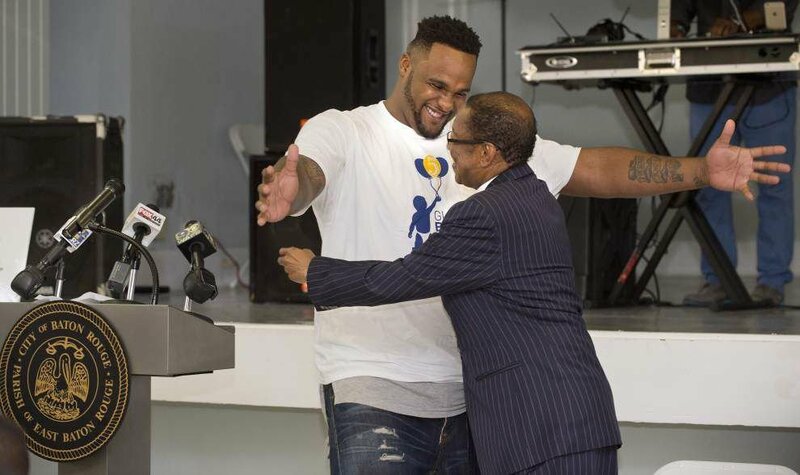 Advocate staff photo by TRAVIS SPRADLING -- Former LSU and current National Basketball Association player Glen 'Big Baby' Davis, left, embraces East Baton Rouge Mayor-President Kip Holden, right, at a Friday press conference to launch Baton RougeÕs 'My BrotherÕs Keeper Local Action Plan,' at the Family Youth and Service Center. Davis' foundation is a partner supporting youth literacy, in the local action plan being implemented as part of President ObamaÕs My BrotherÕs Keeper initiative, geared to improve life outcomes for boys and men of color. Advocate staff photo by TRAVIS SPRADLING -- Gail Grover, Assistant Chief Administrative Officer for the East Baton Rouge Mayor-President's Office, at Friday's press conference to launch Baton RougeÕs 'My BrotherÕs Keeper Local Action Plan,' at the Family Youth and Service Center. Advocate staff photo by TRAVIS SPRADLING -- I CARE specialist Susan Thornton holds a gigantic model of a cigarette, as she explains the many toxins and adverse health effects of smoking to youngsters at the kickoff of the EduFest educational festival, a part of the local action plan being implemented as part of President ObamaÕs My BrotherÕs Keeper initiative, geared to improve life outcomes for boys and men of color. The events followed a Friday press conference at the Family Youth and Service Center to launch Baton RougeÕs 'My BrotherÕs Keeper' local action plan. Advocate staff photo by TRAVIS SPRADLING -- YEP (Youth Empowerment Program) Village participants including from front left Joshua Robinson, 11, and Mark Swanigan, 12, participate in a dance at the kickoff of the EduFest educational festival that is a part of the local action plan being implemented as part of President ObamaÕs 'My BrotherÕs Keeper' initiative, geared to improve life outcomes for boys and men of color. The event followed a Friday press conference to launch Baton RougeÕs MBK local action plan, at the Family Youth and Service Center. Mayor-President Kip Holden on Friday officially launched an initiative to help black and Latino boys overcome barriers to success in adulthood, focusing on getting them ready for school and reading on grade level by the time they are 8 years old. Among the supporters of the effort is former LSU basketball star and Los Angeles Clippers player Glen “Big Baby” Davis. Baton Rouge is one of more than 200 communities that has accepted the challenge. Under President Barack Obama’s initiative, businesses, foundations and community groups will coordinate investments to support programs that help keep young people out of the criminal justice system and improve their access to higher education. Several foundations pledged at least $300 million over five years to promote that goal. For its part, Baton Rouge’s My Brother’s Keeper task force has developed a local action plan laying out initial plans to improve school readiness, which it plans to submit to the White House later this month. Gail Grover, the mayor’s assistant chief administrative officer, is heading up the task force. She said in all likelihood the task force will seek a grant to help fund aspects of its work but is still determining where additional resources might be needed. She said the focus on early childhood and elementary reading emerged during a summit the task force held. “We thought that there would be less redirection of teenagers (into the criminal justice system) if we started with zero to third grade,” Grover said. Grover noted the city-parish already has programs that aim to help older kids, including the BRAVE program. The task force plans to focus much of its initial work on early literacy, specifically helping Volunteers In Public Schools and its Everybody Reads program. That program recruits and trains adults who sit down with struggling readers at least once a week to help them learn to read. There are 15 schools targeted, with the goal of finding nearly 400 more VIPS reading friends for children who don’t have adults to read with. “We know it works. It makes a difference,” said Judy Bethly, executive director of VIPS.